Bring safety and security to your home with a wireless video doorbell. Easily answer the door, wherever you are, by receiving crystal clear images and enabling 2-way audio straight to your smart device via the App. The handy motion detector feature sends alerts to your device when someones near the front door. For additional security, day and night mode automatically switches and images are clearly visible even in darkness, for safety at all times. With quick and convenient setup, install the App and connect the doorbell to your home Wi-Fi network in minutes. The stylish and slim design will be a great addition to the front of your house, simply mount to the wall and be assured with the confidence of knowing whos at the door, whether youre at home or out. 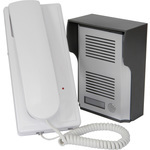 This wireless door phone system allows you to talk to your visitors before opening the door. 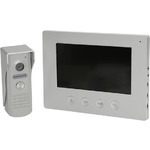 No wires required between the door bell and the phone, making this system very easy to install. Good for security and helpful for the elderly or less mobile.